The bhavachakra (Sanskrit; Pāli: bhavachakka; Tibetan: srid pa'i 'khor lo) is a symbolic representation of saṃsāra (or cyclic existence). It is found on the outside walls of Tibetan Buddhist temples and monasteries in the Indo-Tibetan region, to help ordinary people understand Buddhist teachings. Bhavachakra, "wheel of life,"[a] consists of the words bhava and chakra. In Buddhism, bhava denotes the continuity of becoming (reincarnating) in one of the realms of existence, in the samsaric context of rebirth, life and the maturation arising therefrom. It is the tenth of the Twelve Nidanas, in its Pratītyasamutpāda doctrine. The word Chakra (चक्र) derives from the Sanskrit word meaning "wheel," as well as "circle" and "cycle". "Circle," used in a variety of senses, symbolising endless rotation of shakti. A circle of people. In rituals, there are different cakrasādhanās in which adherents assemble and perform rites. According to the Niruttaratantra, chakras in the sense of assemblies are of 5 types. The term chakra is also used to denote yantras (mystic diagram)s, variously known as trikoṇa-cakra, aṣṭakoṇa-cakra, etc. Different nerve plexuses within the body. 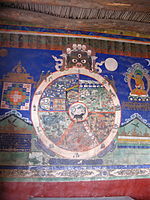 The bhavacakra is painted on the outside walls of nearly every Tibetan Buddhist temple in Tibet and India, to instruct non-monastic audience about the Buddhist teachings. The pig, rooster and snake in the hub of the wheel represent the three poisons of ignorance, attachment and aversion. This figure is often interpreted as being Mara, the demon who tried to tempt the Buddha, or as Yama, the lord of death. Regardless of the figure depicted, the inner meaning remains the same–that the entire process of cyclic existence (samsara) is transient; everything within this wheel is constantly changing. 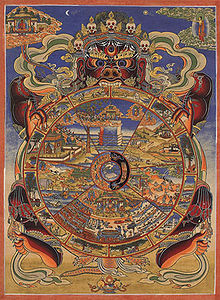 Above the wheel is an image of the moon; the moon represents liberation from the sufferings of samsara. Some drawings may show an image of a "pure land" to indicate liberation, rather than a moon. The upper part of the drawing also shows an image of the Buddha pointing toward the moon; this represents the path to liberation. While in Theravada Buddhism this is the Noble Eightfold Path, in Mahayana Buddhism this is the Bodhisattva path, striving to liberation for all sentient beings. In Tibetan Buddhism, this is Lamrim, which details all the stages on the path, while Zen has its own complicated history of the entanglement of meditation practice and direct insight. It is the beginningless round of rebirths that is called the 'Wheel of the round of rebirths' (saṃsāracakka). Ignorance (avijjā) is its hub (or nave) because it is its root. Ageing-and-death (jarā-maraṇa) is its rim (or felly) because it terminates it. The remaining ten links (of the Dependent Origination) are its spokes (i.e. karma formations [saṅkhāra] up to process of becoming [bhava]). Some western interpreters take a psychological point of view, explaining that different karmic actions contribute to one's metaphorical existence in different realms, or rather, different actions reinforce personal characteristics described by the realms. According to Mark Epstein, "each realm becomes not so much a specific place but rather a metaphor for a different psychological state, with the entire wheel becoming a representation of neurotic suffering." ^ Gethin 1998, pp. 158-159. ^ Thomas William Rhys Davids; William Stede (1921). Pali-English Dictionary. Motilal Banarsidass. p. 499. ISBN 978-81-208-1144-7. ^ Mallory, J.P; Adams, D.Q. (1997). Encyclopedia of Indo-European culture (1. publ. ed.). London: Fitzroy Dearborn. p. 640. ISBN 978-1-884964-98-5. ^ Bhattacharyya, N. N. (1999). History of the Tantric Religion (Second Revised ed.). New Delhi: Manohar. pp. 385–86. ISBN 81-7304-025-7. ^ Dzongsar Khyentse (2004), p. 3. ^ a b Dalai Lama (1992), p. 42–43. ^ Dalai Lama (1992), p. 41-43. ^ Sonam Rinchen (2006), p. 8-9. ^ Ringu Tulku (2005), p. 30. ^ a b c Dalai Lama (1992), p. 4, 42. ^ Ringu Tulku (2005), p. 31. ^ Khandro Rinpoche (2003), p. 65-90. ^ Chögyam Trungpa (1999), p. 25-50. ^ Dalai Lama (1992), p. 5-8. ^ a b Dzongsar Khyentse (2005), p. 2-3. ^ Patrul Rinpoche (1998), p. 61-99. ^ a b c d Sonam Rinchen (2006), p. 9. ^ Buswell & Lopez 2013, p. 112. ^ Birmingham Museum of Art (2010). Birmingham Museum of Art: Guide to the Collection. London, UK: GILES. p. 32. ISBN 978-1-904832-77-5. Archived from the original on 2011-09-10. Retrieved 2011-07-12. ^ a b Dalai Lama (1992), p. 43. ^ Karunaratne, T. B. (2008), p. 14. ^ Epstein, Mark (2004), p. 17. Teiser, Stephen (2007). Reinventing the Wheel: Paintings of Rebirth in Medieval Buddhist Temples. University of Washington Press. ISBN 9780295986494. This page was last edited on 13 March 2019, at 14:02 (UTC).